How to modify all the endpoints to have latest version, possibly without opening the scripts? 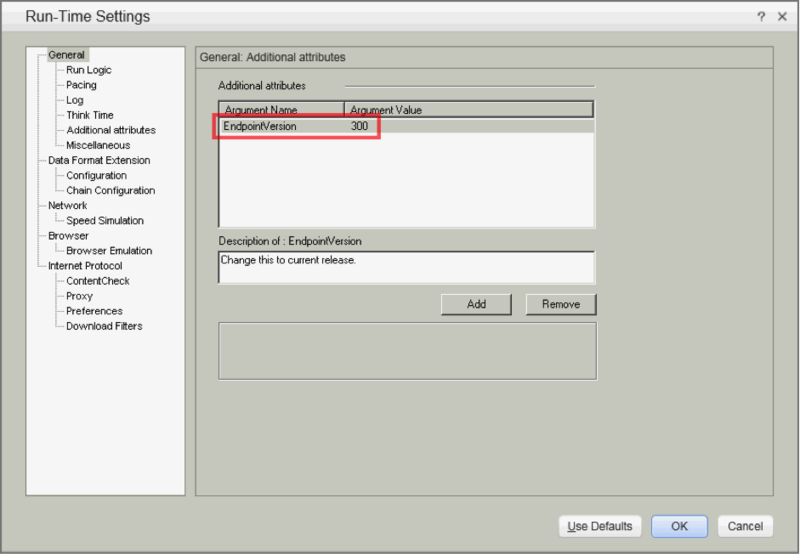 Drawback: You will have to update the parameter value every time the endpoint version changes. Thus, you will have to download, open and update the parameter in all the scripts. This activity is very time consuming especially when it comes to VUGEN 11.52 as we all know how slow it is for opening scripts. Have a look a solution 2. Solution 2 (preferred): In your script, go to RunTime Settings(RTS) under ‘Additional Attributes’, add a new argument name and a argument value. For example: argument name ‘EndpointVersion’ with argument value ‘R300’. Then use the statement lr_get_attrib_string(“<Argument Name>“) to retrieve the argument value. In our example, use lr_get_attrib_string(“EndpointVersion“) to retrieve the value ‘R300’. Action.c(27): Notify: Saving Parameter “rVersion = R300”. Benefit: If the endpoint version changes, you can modify the RunTime Settings (RTS) for all the scripts in the scenario in Performance Center itself. You don’t need to open and update it in individual scripts. If all the scripts use same RTS, then it’s even easier. Just modify RTS of one script and duplicate the RTS to rest of the scripts. Following screenshot shows the location of ‘Duplicate Runtime Settings’ option in Performance Center. Hope it helps to someone! This is an awesome explanation, It is so useful when we run more scripts on different environments. I do have a quick question is that can we do this in Load Controller? as i have gone thru your posting it looks like can be done in performance center. Performance center is just a web UI on top of controller. You can do this in controller as well.